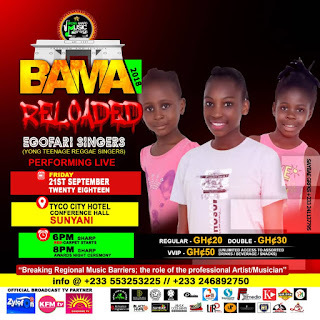 Talented Sunyani based reggae group Egofari Singers has disclosed to fillascorner.com that they are ever ready to performed at the Brong Ahafo Music Awards on September 21. Egofari Singers is a teenage reggae group made up of Empress Ama Sabbatina Yeboah (13years), Empress Akosuah Asamoah Gyasi Okuoba (5years), Empress Rhoda Esi Gyasi Okuoba (7years) and Nana Afua Gyasiwaah Okuoba (Sedilabuuka) (11years). In an interview, they disclosed to King Solomon that despite been children they are ready and have no fear to perform at BAMA. "Yes we are children but do not fear performing in front of the crowd, we will surprise the audience with good and energetic performance if Reggae music"
They urged music lovers especially reggae music to come in their numbers on the 21st September at Tyco City. Egofari Singers are out with Three (3) singles Victory Crown, Jah's Achievers and Awurade Do (God's Love) which us enjoying massive air play in Brong Ahafo Region. The maiden edition of the Brong Ahafo Music Awards organized by J-Black Code Events which is slated on the above mentioned date will happen at the Tyco City auditorium in Sunyani, the regions capital.